Can you believe it? It is time for the 25th Anniversary concert of Shirim on Feb. 17, 2:00 at the Regent Theater, 7 Medford St., Arlington, MA. Tickets are $12.50, $8 for seniors and kids. Call the box office at (781) 646-4849 for tickets or visit www.regenttheatre.com. We are keeping the price low in the spirit of celebration and because we are making a video of the concert and want to have you there! Buy your tickets early! Our first gig was 25 years ago at a Purim party at MIT, if I remember correctly. And since then we have played hundreds of weddings and Bar Mitzvahs in the Boston area- maybe yours? We have recorded 7 unique CDs, we have worked with Maurice Sendak and Ellen Kushner, played on the soundtrack of a Woody Allen movie, toured across the U.S.A., Canada and Europe, and we keep playing here in Boston through it all. Remember the annual December 25th concerts at Coolidge Corner? First Night at Berklee Performance Center? Hanukah celebrations at Downtown crossing in the freezing cold? It has been a long road, and we keep on going on! So come and see us again! We’ll play some fresh music and some chestnuts. Hope to see you there! 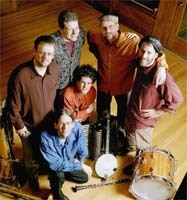 Shirim started performing in 1982 at the beginning of the current klezmer revival and has performed across the United States, Canada and Europe. The band has collaborated with children’s author/artist Maurice Sendak to create the Parent’s Choice award winning “Pincus & the Pig,” a Jewish/klezmer adaptation of “Peter and the Wolf” and won a Gracie Award for their Hannukah project with NPR’s Ellen Kushner, “The Golden Dreydl: a Klezmer Nutcracker.” Shirim is featured on the soundtrack of Woody Allen’s “Deconstructing Harry” and has released seven recordings on the Tzadik, Rykodisc and Newport Classic labels. The band has performed with Peter Nero and the Philly Pops, the Niagara Symphony, and at major international jazz and klezmer festivals. The band is based in Boson and has performed at hundreds of weddings and Bar Mitzvahs for local residents, even playing weddings for couples and returning years later to perform at the Bar Mitzvahs of their kids! Shirim’s annual Christmas Day concerts at the Coolidge Corner Theater were a tradition in the 1990s, fondly remembered by many. The band boasts members who are highly respected veterans of the klezmer revival, Glenn Dickson on clarinet, David Harris on trombone, Michael McLaughlin on piano and accordion, Jim Gray on tuba, Eric Rosenthal on drums and Brandon Seabrook on banjo. Their concerts reflect both a seriousness of musicianship and a strong emotional resonance with the music.